Captivating children to learn science in the great outdoors is highly valuable. By hooking their interest through the concept of geocaching, a new avenue for learners is opened. Children are able to take ownership of their learning, increasing engagement and enjoyment. Come with us on this journey and see for yourself! Our geocache is aimed at introducing children to food webs, scientific terminology and the concept of interdependency between plants and animals. 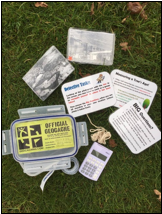 The geocache can be adapted to suit your needs, for example; change sorting categories to invertebrates/ vertebrates or to a “minibeast hunt” which can work well within any woodland or school grounds. 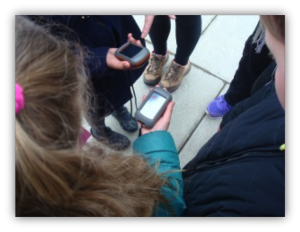 Geocaching can build confidence and group working skills along with scientific knowledge in a place based learning environment. 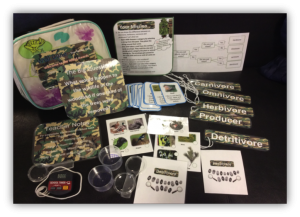 Living things sorting game – Producer/herbivore/omnivore/carnivore/detritivore; identify and categorise cards into groups. The children are given clues and help cards with pictures to allow for differentiation. ‘Scavenger hunt’ game. The children are to search for the animals/plants found in their group (herbivore/carnivore/omnivore/detritivore/producer). Award Ceremony – To complete the mission, children are asked to provide definitions of all categories and to provide an example from each. Assessment cards and teacher notes are within the cache. The Big Question – What would happen to the wildlife in the woodland if one third of the trees were removed? 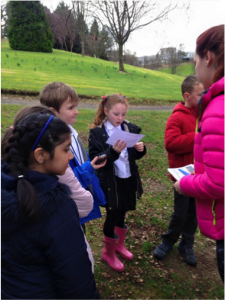 P4 trial day, the children offered answers of; “the animals would move out of the area” and “the wildlife would die”. This and other questions can foster deep discussions and enable further study when back in the classroom. Photographs or further visits to record seasonal changes to allow for further learning opportunities. Investigating habitats available in the school grounds; is it possible to design an additional wildlife area to include living things not already present? (bird boxes, wild flowers, log pile etc.). Go global, invite your international school/ twin school to complete the same investigations and swap information found via photos, recordings, graphs, charts or power points. Make your own class geocache for other classes to complete. Frozen Over was a temporarily way marked cache located at a place responsive site within the Stirling University Campus on a forest pathway on Hermitage Road, which leads to Airthrey Castle. The pathway is clear, wide, and easily accessible to all ages and ability, ideal for school groups. The geocache, a sealed plastic tub, is located under a large rock covered in moss, leading to the first part of enquiry. Opposite this is a large wall with an exposed rock face which shows a compressed rock formation running through it which was formed during the ice age 300 to 350 million years ago during the Ochils Fault Line event which is where the activity takes place. 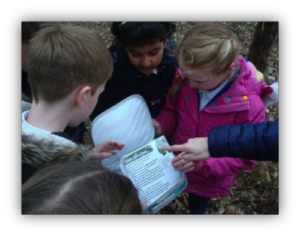 The contents of the ‘Frozen Over’ geocache were chosen as it encouraged active learning for children in the place responsive environment, focusing on the topic of geology. It included coloured crayons and paper to carry out the rock rubbing activity which allowed children to feel and observe the rock formation and learn how the ice age formed it, following the scientific topic of geology. Teacher information and question cards were also included to allow an exciting and responsive experience for learners. Children were encouraged to feel the moss and question what may use the moss as a habitat, which then leads on to the topic of sustainability as human activity affects climate change, which in turn affects wildlife habitat which we need to sustainably protect. 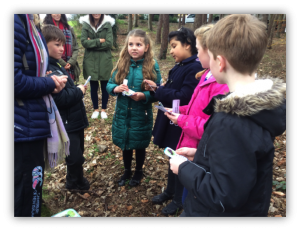 Both the information, questions and activity within the geocache encourage classroom leaning, investigation and enquiry skills, with quiz questions at the end allowing children to describe and explain the important facts and features of the site, encouraging active recall and enquiry. 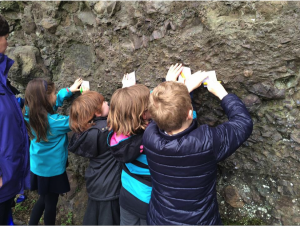 The activity of rock rubbing is explained in detail in the geocache and allows children to identify the area of condensed rock, and then learn why it had been formed this way. The geocache includes crayons and paper to rub the pattern of the rocks as they hold the paper against the rock and rub the crayon over the paper. The bright colour helps children see the pattern of rock formation clearly, which can then be taken to the classroom for them to form their own rock wall. The activity encourages group and independent learning, building self-esteem and independent thinking. 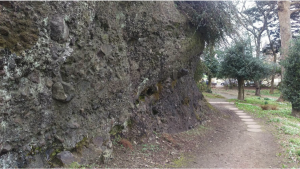 This geology based geocache follows the curriculum for excellence for science, learning experiences and outcomes in Biodiversity and Interdependence as the moss covered rock shows habitat and biodiversity, whilst the wall face shows the Processes of the Planet through learning about the ice age and climate change, with the rock rubbing activity allowing children to form their own wall within the classroom. Both sites can offer further learning on sustainability through the importance of reducing human impact on the climate and importance of protecting natural habitat for wildlife, linking the two concepts with geology. The big idea in science that this geocache follows is the composition of the earth and its atmosphere and the processes occurring within them shape the earth’s surface and its climate. “Geo-Stache” is a temporary ‘waymarked’ geocache which has been hidden at the base of a tree, in a discrete location beneath the bridge on the south side of the Stirling University campus. The objective here is to provide an amusing search for the pupils to “kick off” the cache. The site is easily accessed from a public footpath and due to the even terrain, is highly suitable for the associated tasks. This site was selected by looking at archived photographs from the 1960’s that were sourced from the University Library. 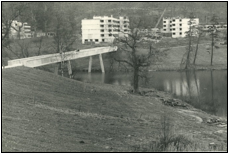 These photographs not only provided a snapshot of the University Campus at that time but also showed the transformation of this area from managed grassland, prior to the construction of the University in 1967 to how it is today. The pupils were given a photograph to act as a motivational hook, and then had to work with their peers to locate the position of where it was captured. This was in close proximity to the geocache, which encouraged pupils to engage with their surrounding environment by reacting to a stimulus, making this cache place-essential. 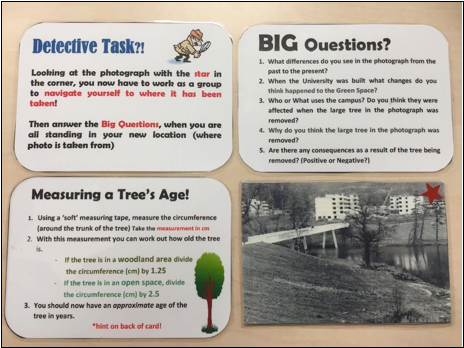 After navigating to the photographer’s location, the ‘BIG Questions’ are then used to facilitate enquiry-based learning. The questions provide the opportunity for the pupils to have an open-ended discussion at a level relevant to their own knowledge and understanding. Due to the nature of a collaborative discussion, incidental learning and scaffolding occurring between peers, this allowed for confidence and self-esteem to be built. 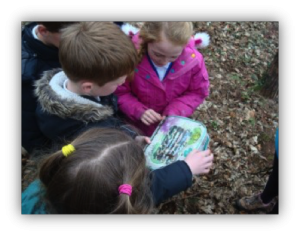 The nature of this cache lends itself to first and second level (CFE) pupils. 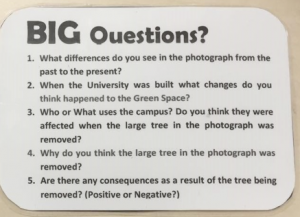 The second activity links the ‘BIG questions’ to the place. It involves the pupils measuring the age of one of the trees that is present today (also captured in the 1960’s photograph). This can stimulate more discussion on why particular trees have been removed. In the cache there is a measuring tape, string and a calculator alongside a set of instructions detailing the process of the calculation. This draws on the sustainability focus which explores the impact of lost green space and more specifically the removal of trees (associated environmental effects). This informal conversation raised the sustainability link for all. Therefore the cache should be presented to small groups of pupils for maximum engagement. 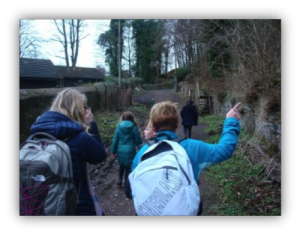 The cache promote further enquiry-based learning out in the field as well as back in the classroom potentially looking at their local environment or just seeking out areas of greenspace changes further afield. Due to the accessible nature of this cache both in location and tasks, it can be completed regardless of weather, time of year and ability which results in there being no obvious barriers to learning. Alan Atkinson and Kirsty MacKenzie. 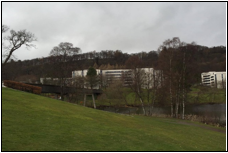 Our geocache is * located by the loch-side, in an open green space, (with a wide view of the loch and its surrounding environment) and a short walk from the Airthrey Loch bridge. The main focus of the geocache activities are about water based habitats and conservation, thus, the clear view around the open space assists the children in their tasks from this location. 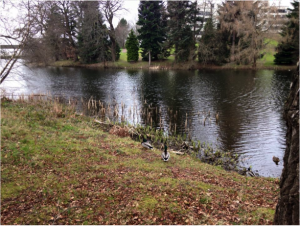 One of the main purposes for the geocache was to influence learning about the wild birds on the loch. For the children to understand the needs of the birds, they identified the wildlife as part of their first task. We have included an activity pack for children to use to help with this, using laminated identification cards. 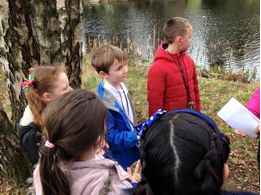 In the second task, the children had to question what would be more important, building a renewable energy plant or protecting the vulnerable species on the loch. 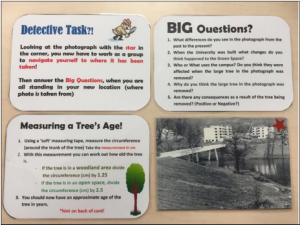 This activity prompted a discussion between the children using open questions, again included with the geocache on laminated card and a talking stick was in place in the box to allow the children to take turns to talk and go over their opinions in their group. It also provided the group with a way to listen to others and work on their communication skills. 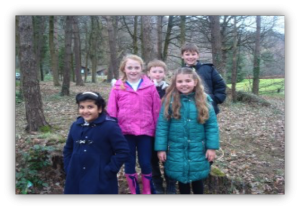 This geocache allows the children to work in a group setting but also to apply their prior scientific knowledge of renewable energy and biodiversity. The children were particularly engaged n this activity, which could be because of the real life context through which they were learning. 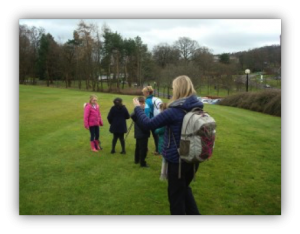 They also developed their identification skills and their understanding of water based habitats by identifying as many water birds as they could. These activities allowed children to discuss the need for conservation and protection of flora and fauna through a real life context that exploited the interconnected nature of science and the science curriculum within the Curriculum for Excellence. This geocache also promotes Learning for Sustainability, as the children are encouraged to think about how humans effect the environment. The landscape around the geocache has a number of benefits. Personalisation and choice were key in this task and children chose who they worked with and where they worked in the area, they also identified hazards and the risks they posed as well as ways to manage those risks. The questions allowed them to work at their own pace. As the activities contained in the geocache could not be completed just anywhere, but instead relied on the location of the cache. The learning that took place was ‘place essential’ this provided an opportunity to connect with the landscape and its wildlife that might not have been available had we included a different task. Throughout the geocache the children must consider some big questions regarding the value of outdoor spaces. In the second activity, they needed to use the scenario cue, to question how to conserve and maintain sufficient renewable energy, providing a sustainability ethos about the geocache. It is hoped that through discussion and further questioning children will employ high order thinking skills to critically evaluate ways to protect, conserve and sustain outdoor places. I’ve just had a kind message from C Powell, a scout troop leader (from I am not sure where) who have found our site to be super helpful for her Scout Juniors aiming to get their “Geocacher” badge. Thanks to them for another helpful resource … It’s http://gogocharters.com/blog/a-beginner-s-guide-to-geocatching and it’s a great beginners guide on geocaching.